MEAA members were out on the streets of Bondi and Paddington on Saturday to raise the profile of the future of the ABC as a key issue in the October 20 Wentworth by-election. 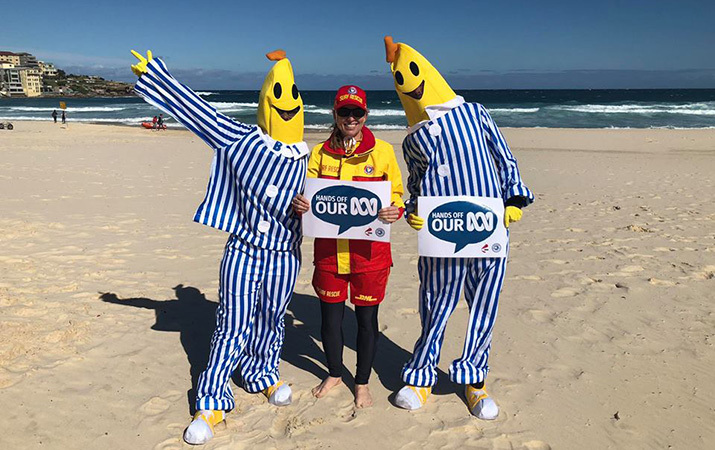 Accompanied by the characters B1 and B2 from Bananas in Pyjamas, and much-loved Playschool host Benita Collings, about 20 activists spent the day informing voters about the multiple threats to the ABC, including political interference in its journalism and funding cuts. The action was part of the Hands Off Our ABC campaign. With the ABC leadership crisis still unresolved and several investigations underway into whether former chairman Justin Milne sought to intervene in ABC editorial operations on behalf of the federal Coalition government, all candidates in Wentworth must declare where they stand on the ABC’s independence and funding, says MEAA chief executive Paul Murphy. MEAA is calling on candidates in Wentworth to commit to restoring ABC funding to a sustainable level, respecting the editorial and programming independence of the ABC, keep the ABC commercial free, and not privatise or commercialise any parts of the ABC. “As our members demonstrated through their spontaneous action which led to the resignation of Justin Milne last week, the independence of the ABC must be sacrosanct from any political interference,” Mr Murphy said. “We know that the vast majority of Australians feel the same way, but unfortunately political interference is just one of the threats to the ABC. “Hundreds of millions of dollars of funding has been cut in the past few years, resulting in more than 1000 job losses, and as recently as June the Liberal federal council voted 4:1 in favour of privatising the ABC. View a photo gallery on Facebook.